Valentine’s Day is a big money-making business and many businesses see a huge increase in sales, not just the card and flower shops. Almost £1 billion was spent on Valentine’s gifts in the UK in 2017 and a similar figure has been estimated for 2018 too. Over in the States, more than $18.9 billion dollars was spent on retail spending last year for the big day. With this in mind, it’s vital you ensure your #brand is ready for Valentine’s Day and has an effective marketing campaign in place to draw in the customers and get your hands on their cash. We’ve taken a look at some of this year’s, and previous year’s campaigns. McCain launched a new marketing campaign this Valentine’s Day featuring a diverse range of couples. The brand is keeping with its diversity agenda after its last campaign which focused on depictions of modern family life significantly increased brand awareness. In fact, McCain reported a 10% increase in brand meaning and brand perception, plus a 14% increase in brand difference due to its last campaign, so it was a wise idea to keep the theme for its Valentine’s campaign. McDonald’s is putting a ring on it this Valentine’s Day by giving away diamond-encrusted “Bling Mac” ring worth around $12,000. One lucky Twitter user will get their hands on this one-of-a-kind burger by declaring their love for the Big Mac sandwich alongside #BlingMacContest and tagging @McDonalds. The responses have been coming in thick and fast and provide further brand exposure for the chain. This campaign comes as the fast-food chain celebrates its 50th anniversary of the Big Mac. McDonald’s has brought out three different burger sizes to celebrate the Grand Big Mac, Big Mac, and Mac Jr. They are available at selected restaurants for a limited time, but only the biggest fan will win the bling. Last year, Snickers’ famous tagline, you’re not yourself when you’re hungry, took a Valentine’s Day twist with this ad. The brand created a billboard campaign around London to help remind forgetful people to pick up a Valentine’s card. What’s more, there were replaceable cards attached to the billboards which were outside London Waterloo station for three days. Passers-by could grab a card and give it to their significant other. The white ‘Forgetful’ lettering was made from Valentine’s Day cards and was a way for the forgetful among us to ensure their Valentine received a card. 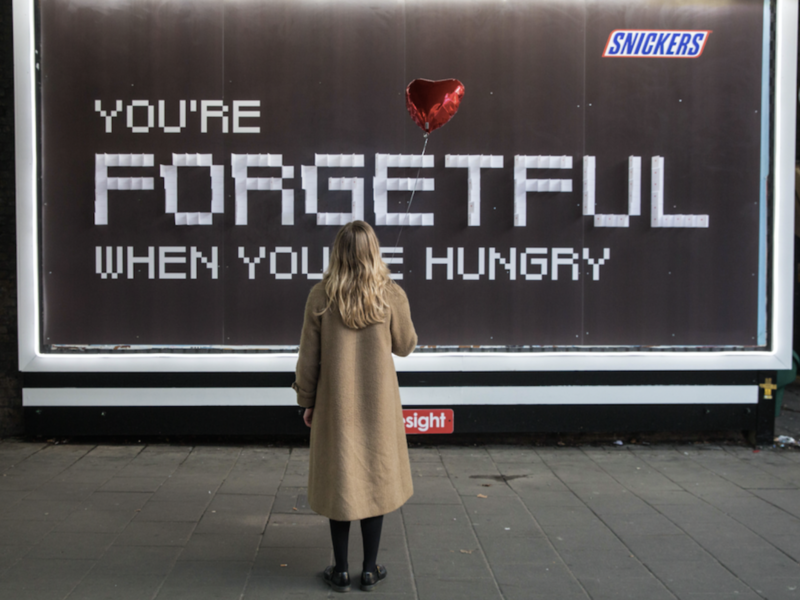 Snickers optimised on this whilst reminding consumers that they are on hand to help the forgetful and the hungry. On the following two days, the cards were replaced with ‘Sorry I forgot. One the plus side, booking a restaurant should be easier. Happy Belated Valentine’s’. A clever and successful way to make the most out of Valentine’s beyond the 14th of February. 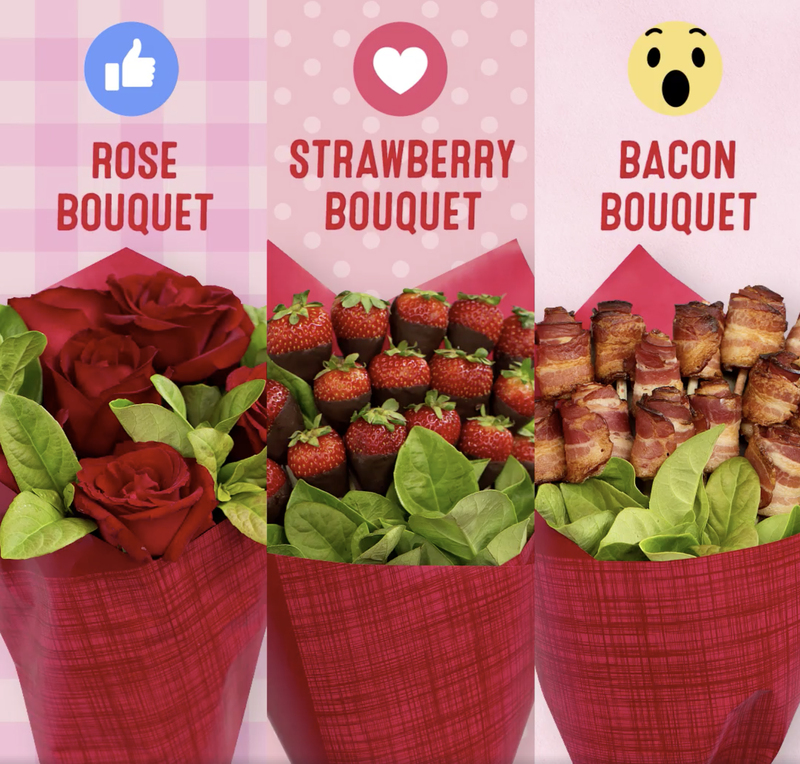 Coles wanted its audience’s opinion last Valentine’s Day and posted a short video asking for them to vote for their favourite type of bouquet: roses, strawberries, or bacon. The Australian supermarket posted on their business page encouraging the audience to react with a ‘like’ for the rose bouquet, ‘love’ for the strawberry bouquet, and a ‘shock’ for the bacon banquet. This simple but effective Valentine’s campaign was a huge success for Coles. The video received 1.9 million views alone and was shared by 1,700 people meaning the extended audience is much larger. There were 55,000 votes with the rose bouquet coming in as the favourite with a staggering 22,000 votes. The strawberry bouquet came in second and the bacon bouquet in third. 5,800 people commented on the post and Coles engaged with the audience by responding to many of them. This is a great move to not only humanise the brand, but also to show that the brand cares and gives something back by acknowledging and replying to your comment. So, there we have it. Some of our favourite Valentine’s campaigns for this year and years gone by. There are many great tips to learn here and we hope it sparks your imagination for future campaigns! We can help ensure your marketing campaign is a success! get in touch with us at hello@creativepod.net. To follow all our news and updates, follow us on Facebook, LinkedIn, and Twitter.